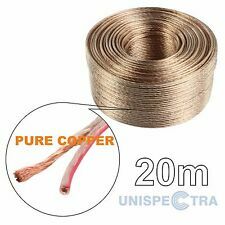 20m Pure Copper Loud Speaker Wire Cable 2x1,0mm. This is high quality - full copper cable not CCA (Copper Clad Aliuminium)! for 10m length - press here. Profigold PGA4220 20m Stereo Interconnect. 2x RCA Phono to 2 x RCA phono plugs. 99.96% Oxygen Free Copper ensures reduced signal loss and crystal clear sound. A TOP QUALITY 42 STRAND LOUDSPEAKER CABLE. LENGTH 20M. STRAND SPEAKER CABLE WHITE. 2 X 42 STRAND 0.15MM. FIG “8” STYLE WITH RIBBED POLARITY LINE. Length: 20m. 3.5mm Stereo Jack Male to 3.5mm Stereo Jack Male. Headphone out (e.g. on a personal cd player) to another jack input (such as audio in on a PC). iPod to Car Stereo. Cable colour: Black. Moulded, Gold Plated Connector. 20M 13 STRAND LOUDSPEAKER CABLE. STRAND / 0.20MM. WHITE WITH BLACK POLARITY LINE. AUDIO / VIDEO CABLES & MORE! 2 x RCA Phono Plugs to 2 x RCA Phono Plugs. Twin RCA Phono Cable. Twin 2 x RCA Phono Plug to Plug. Colour Coded for Left & Right Audio. A TOP QUALITY 42 STRAND LOUDSPEAKER CABLE. LENGTH 20M. STRAND SPEAKER CABLE BLACK. 2 X 42 STRAND 0.15MM. FIG “8” STYLE WITH RIBBED POLARITY LINE. Oversized 1.5mm2 16 AWG BLUE/BLACK. DISTRIBUTION BLOCKS. RCA CABLES. TOSLINK® or Optical Cable is a fiber optic connection system. Since TOSLINK uses fibre-optic cable, it is free from distortion caused by electrical or magnetic interference that an electrical cable would incur. HIGH QUALITY SPEAKER WIRE CURRENT = 2.5A MA x. We promise you we’ll solve your problem. 3.5mm Stereo Jack to 3.5mm Jack Shielded Cable. High Quality Shielded Stereo Audio Cable. 3.5mm Stereo plug to Stereo Plug. Stereo, laptop, Tv, ECT, Your audio will always be the best possible. Our range of audio cables in our blue range are assembled with gold connectors. A TOP QUALITY 79 STRAND LOUDSPEAKER CABLE. LENGTH 20M. PURE OXYGEN FREE COPPER (OFC) CONDUCTORS. STRAND SPEAKER CABLE WHITE. 2 X 79 STRAND 0.20MM. FIG “8” STYLE WITH RIBBED POLARITY LINE. High quality black loudspeaker cables are recommended for HiFi and home cinema systems. Using our cables will ensure that the complete quality of the loudspeaker system will be provided to the listener. The loudspeaker cables establish a lossless connection and ensure a placing without any problem caused be high flexibility. Musicians and technicians are using loudspeaker cables for Home-Cinema- or HiFi-systems. The cable can be converted by yourself by cutting off the length you need. So you won´t have any cable tangle in future. An excellent quality, highly flexible flexible twin core twisted speaker cable with 196 strands of 99.99% Oxygen Free Copper (OFC) conductors that ensures high precision music transmission and crystal clear, crisp sound quality. A TOP QUALITY 79 STRAND LOUDSPEAKER CABLE. LENGTH 20M. PURE OXYGEN FREE COPPER (OFC) CONDUCTORS. STRAND SPEAKER CABLE BLACK. 2 X 79 STRAND 0.20MM. FIG “8” STYLE WITH RIBBED POLARITY LINE. HIGH QUALITY SPEAKER WIRE. HIGH QUALITY CABLE TO GIVE YOU THAT SMOOTH AND CRISP SOUND QUALITY. We promise you we’ll solve your problem. 99.9% Pure OFC Copper Cable. Twin RCA Phono Cables. High quality Twin phono plug to plug leads suitable for audio connections. Twin Phono Cable. Lengths: 20m. If you require the the best audio quality from your Rca cables look no further. Genuine Masterplug Product. Manufactured by Masterplug. 100% Stranded Oxygen Free Copper (OFC)NOT Copper Clad Aluminium (CCA). 16 Gauge Improves sound accuracy & detail due to low signal loos on long runs. High quality 3.5mm stereo jack to 2x phono plugs. Transparent Outer with Red Polarity Indicator. Twin Cable 18 AWG High Spec Loud Speaker Cable. 25M REEL - Loudspeaker (OFC) Audio Cable. 1 x 25m Reel of Professional Grade Speaker Cable:KÖNIG Speaker cable is a professional grade parallel speaker cable. 100's of Micro fine Pure Copper (OFC) stranded conductors, provide low resistance which enable the speaker to operate at optimum levels. Surround sound systems. Due to the cable having such a large amount of copper it enables the sound energy to pass through with allot less resistance therefore giving a much better clarity from your speakers. A High Quality 3.5mm to Twin Phono connection cable with 24k Gold plated plugs. The cable is Individually Screened and 99.99% Pure OFC for the Highest Audio Quality. This reduces corrosion and enhances conductivity for Very High Quality Audio. High quality lead with 2x phono (RCA) type plugs for stereo audio interconnections. Connector Type A: Phono (RCA) Plug, x 2. Connector Type B: Phono (RCA) Plug, x 2. Cable Length: 20 m. Not Specified. 20M 0F 79 STRAND HIGH DEFINITION SPEAKER CABLE. HIGH QUALITY, PURE COPPER HEAVY DUTY MULTI PURPOSE TRANSPARENT SPEAKER CABLE. 20m Length. White Speaker Cable with Black Polarity Indicator. Or preamplifier, the Toslink Cable has got you covered. Carrying a distortion-free, fiber-optic digital audio stream. Toslink cables are compatible with S/PDIF, ADAT's, Dolby Digital, & DTS. Fiber-optic cabling prevents electromagnetic and radio frequency interference that an electrical cable would incur, resulting in better sonic accuracy and a more natural sound. 3.5mm Jack to Twin RCA Phono. 3.5mm Jack Plug to Twin 2x RCA Phono. 3.5mm Stereo Jack Plug to 2 x RCA Phono Plugs. Mm Multi-Strand Quality Speaker Cable. 0.5 mm Squared Cross-Section Area Loud Speaker Cable. mm Squared Cross-Section Area Loud Speaker Cable. The cable comprises a directional shotgun style twin interconnect speaker cable. These cables can be. Speaker cables. many world class recording and mastering studios as well as being the speaker cable of. Surround sound systems. ::: MSG Custom Audio :: Car audio. These countries include but are not limited for the following-. Copies available on request. Garden speakers. Multi room wiring. Russian Federation. 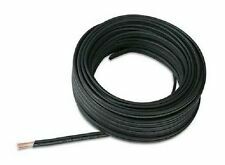 QED 42 Strand Profile loudspeaker cable was launched in 1975 as QED's first ever cable. As QED's entry-level speaker cable,QED 42 Strand combines convenience and performance. QED Profile 42 Strand. Award Winning Speaker Cable from QED. 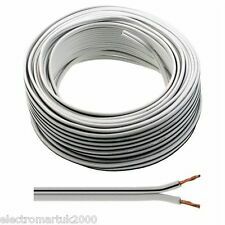 20M 79 STAND OFC (SUPER FLAT 10MM X 1.7MM) SPEAKER CABLE WIRE. OXYGEN FREE COPPER (OFC) BARE COPPER STRANDS. 20M 0F 2 X 79 STAND HIGH DEFINITION OXYGEN FREE COPPER SPEAKER CABLE. STRAND / 0.12MM. 99.999% PURE COPPER. Connectivity: Twin Phono (RCA) male to twin (RCA) male plugs. Length: 20m. Gold plated connectors for improved sound quality. 3.5mm Jack to Twin RCA Phono. 3.5mm Jack Plug to Twin 2x RCA Phono. 3.5mm Stereo Jack Plug to 2 x RCA Phono Plugs. Red & White Colour Coded for Left & Right Audio. Jack to 2x Phono Cable. Hi Quality Gold Plated Stereo Jack Plug to 2 x Male Phono Plugs. Length: 20m. Shielded Gold plated connections for better sound quality and less loss. 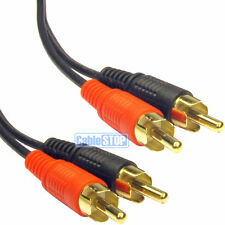 3.5mm Stereo Jack Male to 2x Male RCA Plugs. 20M 0F 42 STRAND HIGH DEFINITION SPEAKER CABLE. HIGH QUALITY, HEAVY DUTY MULTI PURPOSE TRANSPARENT SPEAKER CABLE. OFC SPEAKER CABLE. 2 X 42 STRAND. Loudspeaker and other devices which have a 3.5 mm audio port. 3.5 mm Male to Male Stereo Jack Plug Audio Cable. Interface: 2 X 3.5 mm Male Jack Plug. Compatible with computers, TV sets, DVD Players, CD Players, Headphones, Speaker Microphones. 3.5MM STEREO JACK CABLE, 25M. • 3.5mm Stereo Jack Male (plug)to 3.5mm Stereo Jack Male (plug). 3.5mm Stereo plug to Stereo Plug. Our standard range of audio cables are assembled with gold connectors for a higher quality connection with anti-corrosion properties. Connector 1 : Phono Plug. Connector 2 : Phono Plug. A composite video or digital audio connection lead manufactured from RG59 cable, 75?. Images shown are for demonstration purposes. Composite video or digital audio connection lead. The conductors are oxygen free copper with a polyethylene insulation, surrounded by a strong white PVC outer jacket. The Chord Leyline has been designed as a cost effective way to cable the extra-long runs common in custom installations and even over lengths of 50m or more, will produce exceptional results. Speaker cable is used to connect amplifiers to speakers. Each speaker cable consists of a pair of cables, one for positive ( ) and one for negative (-), usually colored red/white and black. Each speaker cable is made up of a number of copper strands, the more number of strands, the better quality of connection. QX16/2 and QX16/4 LSZH are high performance and exceptional quality installation speaker cables with the added bonus of a fully certificated LSZH fire rated design. RoHS2 Compliant Low Smoke Zero Halogen (LSZH).